My painting, Pikes Place Pearls, will be showing at Shack Art Center in Everett, Washington during the month of December for the NWWS Signature Show! I’m so thankful to the volunteers at Northwest Watercolor Society for putting on the show for the signature artists (a signature artist is one who has had work accepted into several qualifying NWWS shows). There is a lot of work that goes into organizing and hanging a show like this. Thank you, also, to the owners of Schack Art Center. Pikes Place Pearls is a painting from a photo taken during one of my trips to Pikes Place Market in Seattle. Pike’s Place Market truly is one of my favorite places to go. It’s crazy busy there and simply a stimulation for the senses!! I have done many paintings from my visits to the market. When I saw these pearl onions on display, I fell in love with the light, shadows, forms, color, and CARDBOARD BOX (those of you who know me know I have a thing for cardboard)! Anyway, here is the link to the venue, the Shack Art Center. If you are up in Everett, Washington, make sure to check it out! Comment and let me know what you think. Should be a great show. 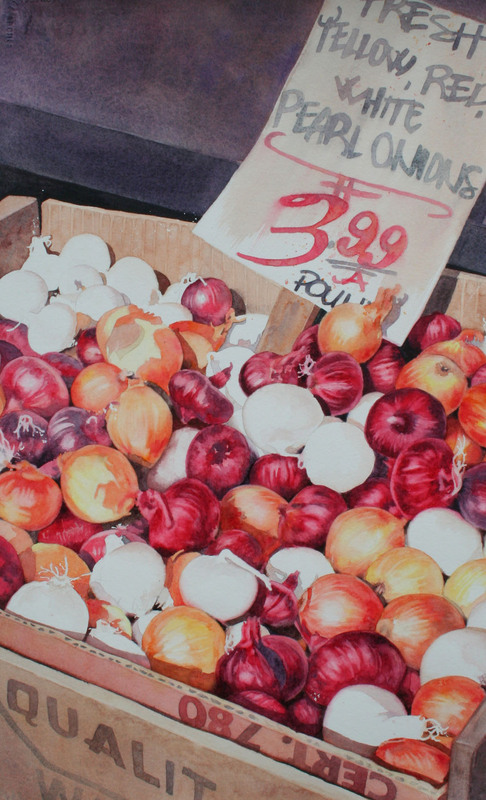 These artists are among the best watercolor artists in the nation!